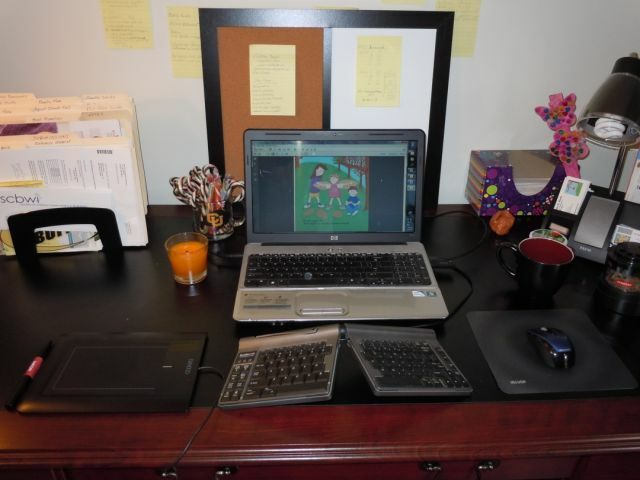 Beating The Odds: Guest Post From Author/Illustrator Alison K. Hertz AND A Giveaway! Today I’m delighted to share a guest post from author/illustrator Alison Hertz, whose debut picture book FLAP! was released from Magic Dreams Publishing in November! Oh wait! One more quick thing. For the first time in WYRI history, we had a tie for the November Pitch Pick! Kim and Larissa scored the same number of votes! I can really only send one pitch per month to Erin, so I’m going to have to ask you all to vote again and choose between these two talented writers! Long, long ago in a faraway land, bulls actually had feathers. And they were big, colorful peacock-like feathers at that! Discover how one very stubborn yet lovable bull lost every one of his feathers– not only for himself, but for all the bulls born in the world after him. This fable-like tale also reveals why the color red will always make a bull’s temper flare! With business dwindling, Chang and his family fear they will have to close their dim sum stand. But with the help of a special dim sum-loving dog who entertains customers, they may save the stand after all. Please vote by noon tomorrow EST (tomorrow being Tuesday Dec. 11) so I can announce the winner on Wednesday! 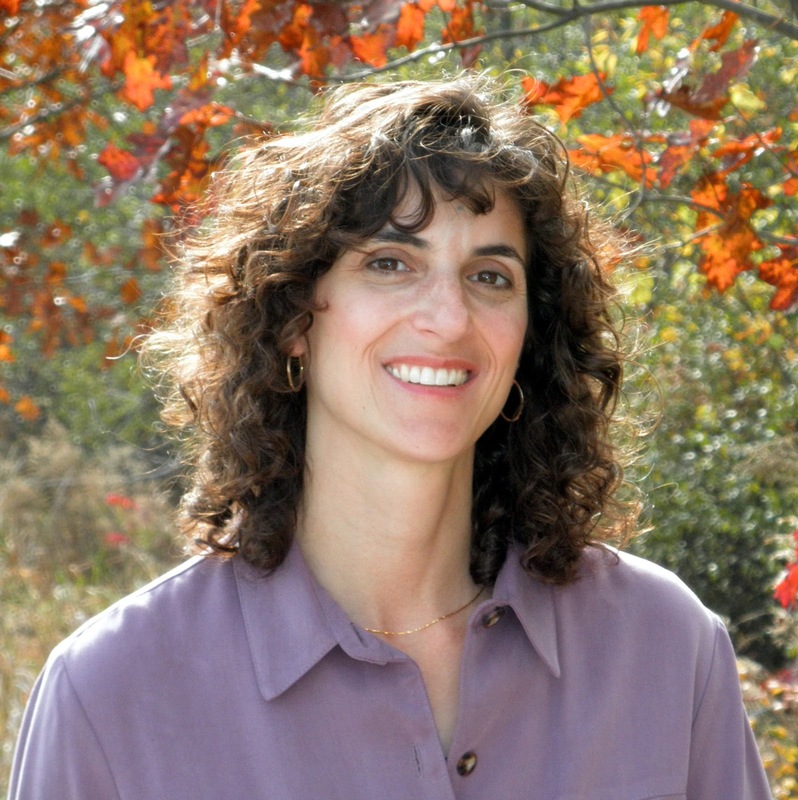 Alison K. Hertz, author/illustrator of FLAP! Welcome, Alison! And thank you so much for joining us today! I’m very happy to be guest posting on Susanna’s blog today. As a writer and an illustrator, I often get asked about how I work. How does an illustrator write stories? How does a writer illustrate stories? How did you create FLAP!? Well, that’s actually kind of complex to answer. The process that I used for FLAP! was quite different from how I write and illustrate stories now. Let me explain. When I wrote the manuscript for FLAP!, I didn’t plan to illustrate it. In fact, I submitted it to editors and agents describing myself as a writer (not mentioning any art training or design experience at all). Actually, I have two college degrees in art (city planning and toy design) and was a professional toy designer for many years. I designed hundreds of toys that were produced and sold in major retail stores but all of that changed in an instant. On my way to the toy company, to finalize some models for a major toy retailer presentation, I was in a terrible car accident. My left arm was broken and permanently dislocated (and I’m a lefty). I also had a bunch of other horrible injuries but there’s no need to go into that now. In short, I was told by the doctors and physical therapists that my arm would have basic function but never be near the level of fine motor movement that I had before. I temporarily became a righty, earned a teaching degree, and began teaching middle school art and technology (both art and tech are used together constantly as a toy designer). Fast forward to 14 years later…Shortly after sending out FLAP! for submission, I received a call from a small traditional press in Illinois that explained they were expanding their line and starting an imprint for children’s books. I had sent it to them because their description was pretty general. They loved my story and wanted to publish it. After the contract was signed, they began their search for the right illustrator for my story. At the same time, the economy tanked and budgets tightened. I was told a year later that they could not afford to hire an illustrator for my story and would probably have drop it from their line. I cringed as I explained to the publisher that I had been a toy designer and an art teacher and that I could illustrate the book. I had not been drawing for many years (except to model examples for my students, which was nowhere near the same thing as illustrating a presentation quality piece). I sent her sketches. She loved them and I became the illustrator for FLAP! I was excited at the opportunity to get published as a writer and an illustrator but scared that my arm couldn’t handle creating 30 finished pieces. It was incredibly difficult to draw for long stretches of time (more than 40 minutes), my wrist and my arm could not handle the extended use of holding a pencil or stylus and the movements required for drawing. I was on a very tight schedule because of the planned publication date and had only 10 weeks to create all of the illustrations from sketch to final. 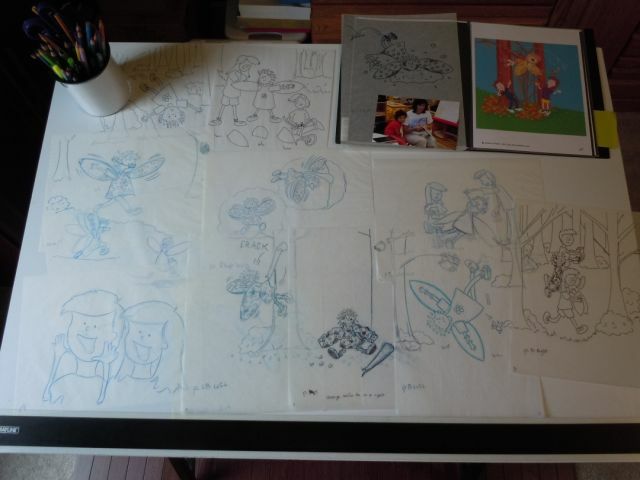 I created the roughs (sketches) by hand. (See above) Once the roughs were approved by the publisher, I scanned the drawings in and taught myself how to use Sketchbook Pro as I created the line drawings. Those drawings went through another approval by the publisher and I was given the okay to create the final, color illustrations. some interior artwork from FLAP! When the illustrations for FLAP! were finished, I accepted that I could be an artist again. I had retrained my left arm to draw. In addition to writing and illustrating, I am using my graphic design skills to design bookmarks, postcards, coloring sheets, business cards, etc… for authors and other professionals. Check out AH Designs at: http://www.alisonhertz.com/graphic-design.htmlfor details, samples, and pricing. 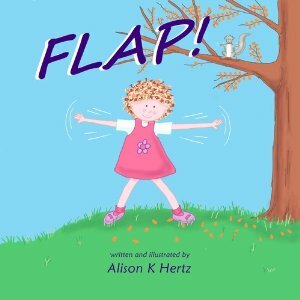 Alison has generously offered to give away a signed copy of FLAP! to one lucky winner! 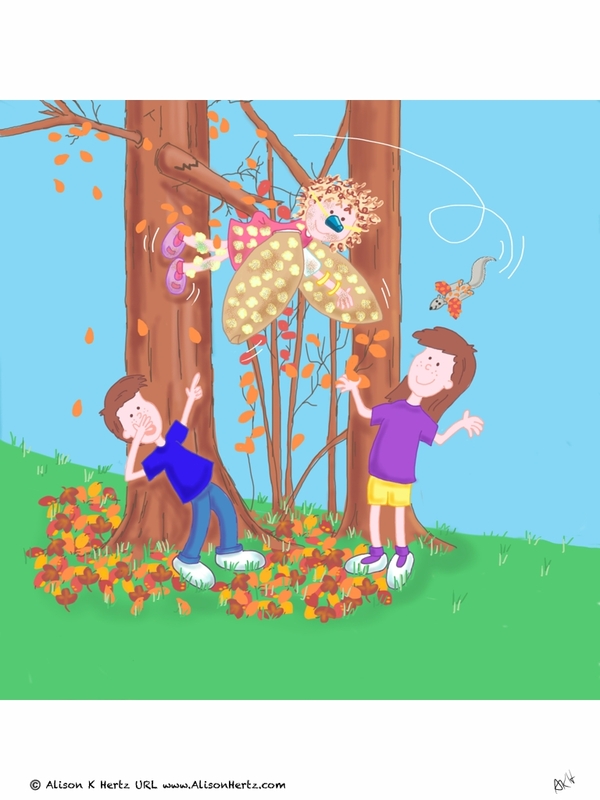 In the book, twins Max and Katie decide to teach their little sister Lilly to fly. At the end, Max says, “I have an idea for tomorrow.” To qualify for a chance to win the book, please write in the comments what bright idea you think Max had – what are those kids are going to get up to tomorrow? Or, if it’s too early on Monday morning and you’re not sufficiently caffeinated to be creative, you can just say who you’d like the book for 🙂 Of course, what Alison would really love is pictures of people flapping – especially kids – so if you can add such a picture to your comment you will get an extra chance at winning! Please enter your comment by Wednesday December 12. Winner will be chosen by random.org. And it could be a holiday gift for someone 🙂 For a nice review of the book, please go HERE. Tina, It would be nice to send books to the docs but there were many and my mind is very fuzzy from that time. I might try to figure out the main physical therapist who built a special brace for me. Coleen, don't worry, there will be mo roof jumping for these kids. I used to jump from the garage to a tennis court at a friend's house. Amazing that I didn't get seriously hurt then. Julie, trying to draw with your opposite hand is no fun but trying to draw with your dominant hand when your arm and hand can't move is even less fun. I was able to become a righty for awhile and taught others to draw, paint and sculpt. Sharing my love for art with students was a good compromise at the time. Thank you, Nancy. The twins made me the object of many of their brilliant ideas so I have a ton of stories to share. Yes, I admit, this is based on a true story. Maybe I'll share the pic of me with wings sometime. Either that . . . or I might possibly have read a comment that mentioned “CRASH” on Laura Miller's review. What a remarkable story. And, I'm so happy that you are illustrating again in a new way. I can relate to your story as I have gone through an injury and had to deal with change. Doctors don't know the human spirit — and I celebrate your book and achievements with you! Thank you, Patricia. I hope your recovery was positive. Thank you, Ruth. I hope you enjoy my blog. Wow, Alison…what an incredible journey! I love your tenacity. Okay, I think that Max's idea is to teach the family pet (dog? cat?) how to fly as well. And I'm part of the first ever TIE?! How exciting! Alison! Wow! What an incredible story you have. It is so inspiring. You really have risen above 🙂 I enjoyed following you through SkADaMo. Your drawings are just so cute! Ooh, that would be cool, Erik! I loved Salamandastron! Subject: [susannaleonardhillblog] Re: Susanna Leonard Hill: Beating The Odds: Guest Post From Author/Illustrator Alison K. Hertz AND A Giveaway! Hi Alison! What a great interview. What an inspiration you are to retrain your left arm/hand again to draw. Your story really moved me. Thank you so much for sharing your journey. Congrats on your book and much more future success! She's pretty amazing, isn't she Loni? I can't even draw to begin with, never mind try to relearn with the wrong hand!